Have you ever been out shopping the day before Christmas Eve when the entire city is packing everything from pineapples to pickles in their carts? And while you wear your itchy winter coat and drippy boots, the carts bump into aisles, people are talking everywhere, and buzzes, dings, and noise are everywhere. It is utterly unorganized chaos. Now imagine you have difficulty ignoring those beeps and buzzes. That itchy wool coat is SO there. The people talk and talk and you hear them all. The utterly unorganized chaos makes you feel so out of sorts that you can't help but breakdown, throwing yourself on the floor, and trying to make it all go away. Children who live with a Sensory Processing Disorder experience situations like this every day. It doesn't have to be a busy holiday for the environment to be too much for their body to organize. It is everyday life for SPD kiddos. They over or under process environmental stimulation at the bus stop, in the library, in a restaurant, or while waiting with Mom at the Department of Motor Vehicles. The disruption of typical processing can occur at minor or severe levels, but is always a struggle. Use of a specialized travel sensory diet can help with over or under sensory responses while out and about. Specific sensory inputs can help to organize these inappropriate sensory responses. Today, I've got a Travel Sensory Diet that can help with sensory needs and can go anywhere. To treat these responses to input, Occupational Therapists perform an assessment of individual abilities and needs. 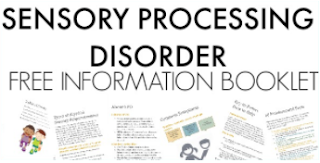 Using information from evaluation, they establish a diet of sensory integration activities to organize sensory systems so that appropriate and meaningful responses occur. Function and purposeful responses to sensory input in all settings are the goals of sensory integration and sensory diets. 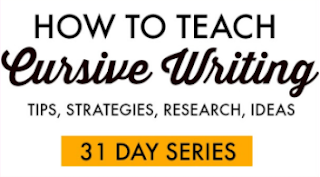 But how do you do these sensory diet activities while in a restaurant or in a library? 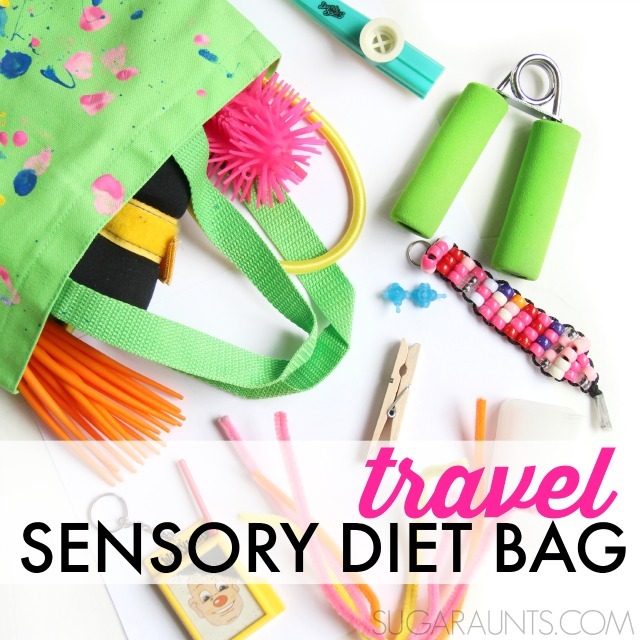 This travel sensory diet is perfect for on-the-go sensory needs. 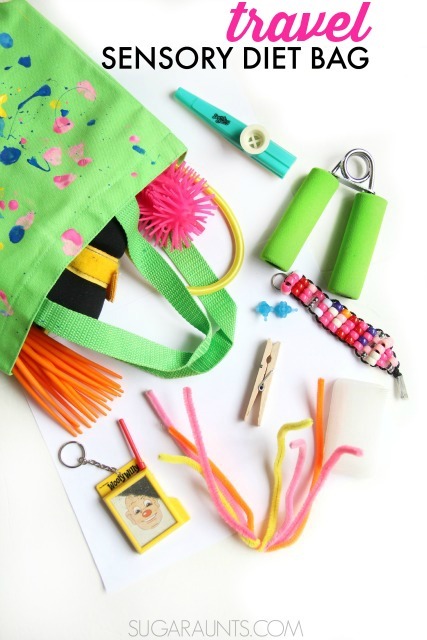 We made a small tote bag with fun paint and used it to create a travel sensory diet. A tote of this size can be slid into a big purse, carried by the child, or carted around in the minivan. The best thing about this travel sensory diet is that you can switch out activities so that new regulating items are added in and old favorites remain. So what do you include in a travel sensory diet bag? Related articles: Read about proprioception here and here. Bungee cord or Exercise band . These can be used by arms or legs while sitting or standing. 1 pound wrist weight: This is an important addition to a travel sensory bag. The weight provides proprioceptive input as the child carries the bag. Sometimes, just carrying the tote bag can be enough to regulate sensory needs. Other ideas include wearing the weight on the wrist, ankle, placed on the lap, or draped over shoulders. Use the weight of the bag as input: While seated, hang the loop of the handles over a knee for weight down through the calf and into the foot. Switch legs after a while. Hang the bag on one shoulder, then the other. Hold the loops of the bag by the hand as if carrying a suitcase. Switch hands often. Hold the loops of the bag by individual fingers. Clothes pins for pinching and providing proprioception to hands. 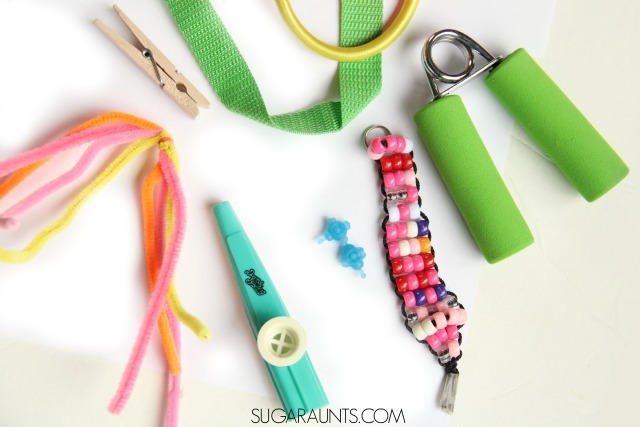 Add a few clothes pins to the tote bag and have your child pinch them onto the exercise band. Small bottle of scented lotion. Fidget with sensory koosh balls. Pipe cleaners twisted together make a great fidget toy. Baby wipe to wipe the face, arms, hands to "wake up" the skin. Hang the head and arms down between the legs to touch the floor. Twisting walks: Twist at the waist as the child walks. Bend over hand hang the head and arms down to the ground. Find a wall for wall push-ups. Hug from a loved one. Carry a sports bottle with crushed ice for resistive sucking and chewing ice. Find stairs and climb them. "Mountain Climb" up a stairwell banister. Use a coat as a sensory wrapper. Wrap the child up like a burrito with an extra coat. "Prayer Stretch" Press the palms of the hands together and press hard. "Spider Finger" Stretches" Place fingertips of both hands together and stretch fingers up and down. Spin in a chair (if at a doctor's office). Weighted vest for situations that you know will cause sensory overload. Headphones to cut out background noise. 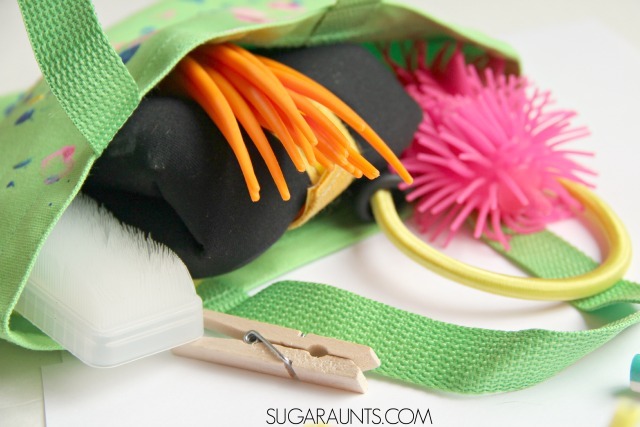 This on-the-go travel sensory bag can go everywhere from the doctor's office with the too-hot waiting room and buzzing fluorescent lights to the hair salon with the noisy dryers and itchy hair clippings. 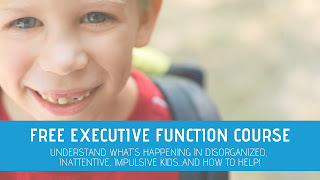 Are you looking for more information on Sensory Processing and Proprioception (or any of the sensory systems and how they affect functional skills, behavior, and the body's sensory systems? 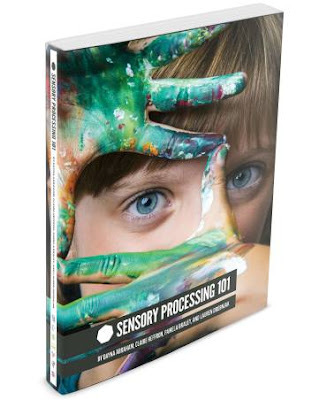 This book, Sensory Processing 101, will explain it all. Activities and Resources are included. Get it today and never struggle to understand or explain Sensory Integration again. Shop HERE. 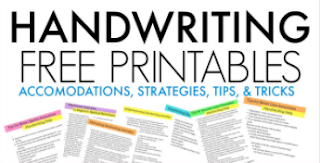 This post is part of our 31 Days of Occupational Therapy series where you can find free or almost free treatment activities and ideas. Stop by every day! You'll find more fun ideas each day in October.